Fig. 2.1. Hiking Along the Millicoma Hatchery Trail. Photo by Anne Farrell-Matthews, April 24, 2018. Local forest recreational opportunities include destinations in and around the Elliott State Forest boundaries. For this plan, we have adopted the recreational opportunities boundary as Highway 101; this allows for more local businesses to be involved. 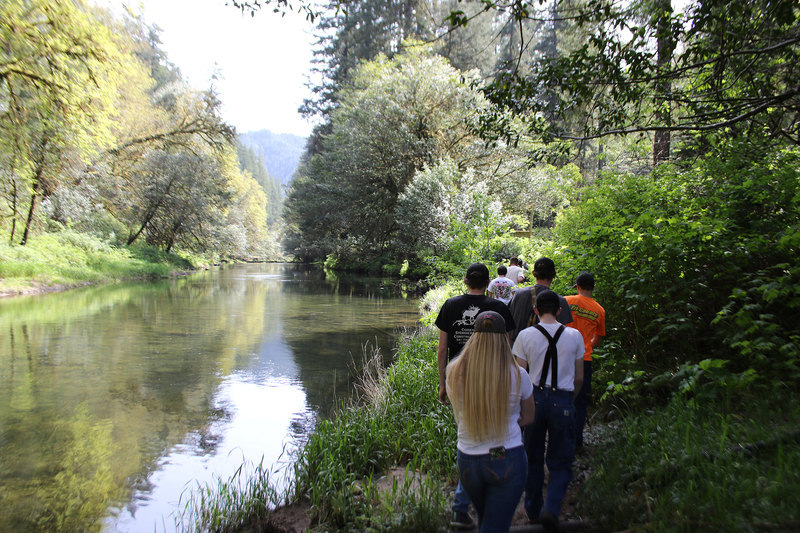 Since the Elliott is under pressure to create revenue for the School Trust Fund, the need for profitable recreation within the forest has become relevant. Currently, there are a number of recreational opportunities laying outside of the Elliott. These include campgrounds, trails, lakes, rivers, and dunes. One of the main attractions that lays on the Elliott’s eastern border is Loon Lake Recreation Site. Loon Lake offers a full variety of outdoor-based activities to participate in, such as swimming, beach volleyball, hiking, and more. Loon Lake incorporates the forest into the campground and surrounding scenic landscape, thereby creating a family-friendly environment. In the fiscal year of 2017, Loon Lake had over 28,000 camping visitors and nearly 15,000 day-use visitors and is the most popular attraction bordering the Elliott Forest. On the south end of the Elliott’s border there is a state park by the name of Golden and Silver Falls. This area is a long drive off Highway 101 (from a tourist perspective), but well worth it because the falls astounding beauty and recreational opportunities. Here there are three main trails to two separate waterfalls, with restrooms and picnic tables near the parking lot. One of the trails includes an information board that tells a small bit of the history in the area. Along the way to Golden and Silver Falls there is a seasonal pumpkin patch known as the Mahaffy Ranch in Allegany. This is where visitors can pick their own pumpkin, go through a corn maze, hay bale rides, and shoot a corn cannon during the months of September and October. They also allow various food vans to host a weekend, therefore incorporating local businesses. Along with those food options, they also provide their own drinks and memorabilia in a small gift shop. In the fiscal year on 2017, an estimated 18,226 people visited Golden and Silver Falls. On the north end of the Elliott’s border is the Umpqua River, which allows for yearlong activities such as fishing, boating, inner tubing, and sun bathing. Being most known for its fishing, the Umpqua River is known to have steelhead and shad fishing. This river is popular locally and statewide. Along Highway 101, the west border for the Elliott recreation plan, Lakeside is a small town that benefits heavily from the through traffic during tourist seasons. Lakeside offers campgrounds and its most popular attraction, Tenmile Lakes. Seasonally on the lakes there are a number of fishing tournaments for bass or trout through local clubs and organizations, attracting active fishermen from far and wide. With more sites for recreation within the forest, there is plenty of potential for increased profit to go towards the School Trust Fund. If there were an increased amount of profitable activity in the forest, there would be a new source of income, aside from current logging practices, which are not producing enough to sustain the school funding. A small item such as a map can be a large investment for the Elliott. For example, if a well detailed map of historical sites such as the Silver Creek Heritage Grove and other scenic points along with roads throughout the Elliott was created it could be sold for $10 in local shops. In a great tourist season, a possible 5,000 maps could be sold, generating $50,000 towards the school fund. Along with the activities themselves, local businesses and sites, such as Tenmile Lakes or gift shops, may provide an area for donations to go towards the School Trust Fund specifically. An opportunity for donations from the tourists in a public maintained area may bring in small profit to put towards small projects. Donations may be encouraged by advertising specific ideas and projects for the local school systems. The Elliott has been mainly used for logging and fire lookouts, therefore the roads are gravel and not maintained as well as city streets. This brings conflicts for various vehicles when traveling to a destination. The Elliott’s roads are not easy to follow for all out of town tourists and some locals, making exploring difficult; and even worse if the tourist does not have the proper vehicle to travel with on the logging roads. These issues can be addressed with more signage in the Elliott, as well as more road maintenance. Map 2.1. Elliott Forest Recreation Area and Campgrounds (Oregon Department of Transportation 2017 base). 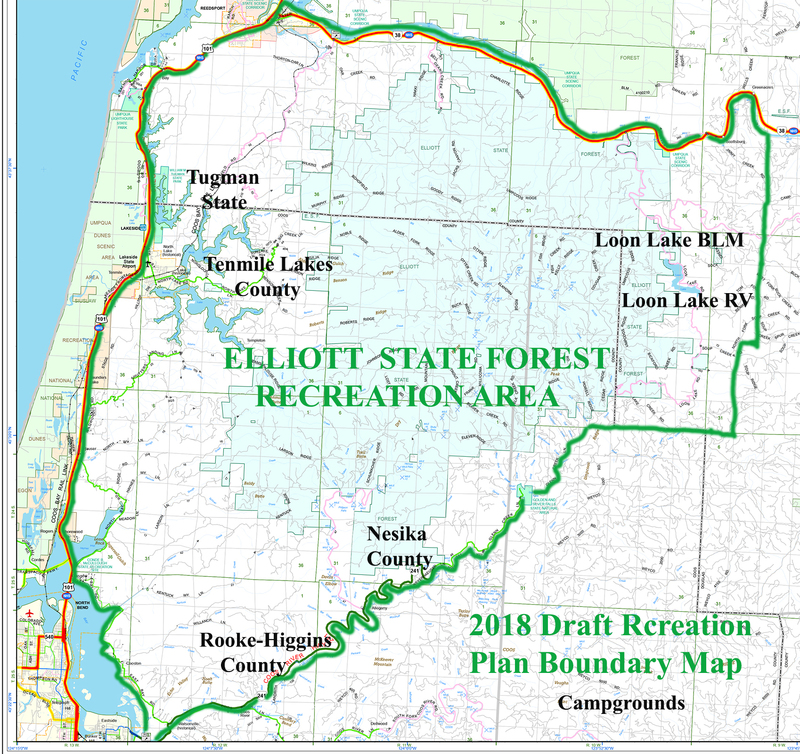 Incorporating local businesses with maps of areas to recreate within or around the Elliott would be a good start to informing the public about the opportunities within the forest. Local businesses bordering the Elliott could also invest in an RV dump, so less pollution is left in the forest. This could come with a grant proposal through the chamber of commerce or Oregon Arts Commission Grants (Oldson 2016: 23). Investing in more scenic trails surrounding the Elliott would also attract more tourists; the only concern is where exactly to place them. Allowing for more trails around the Silver Creek Heritage Grove would be a good tourist destination for local history. Another recommendation given by a local business owner was to “find a beautiful area for a zipline,” which could be a possible large attraction. 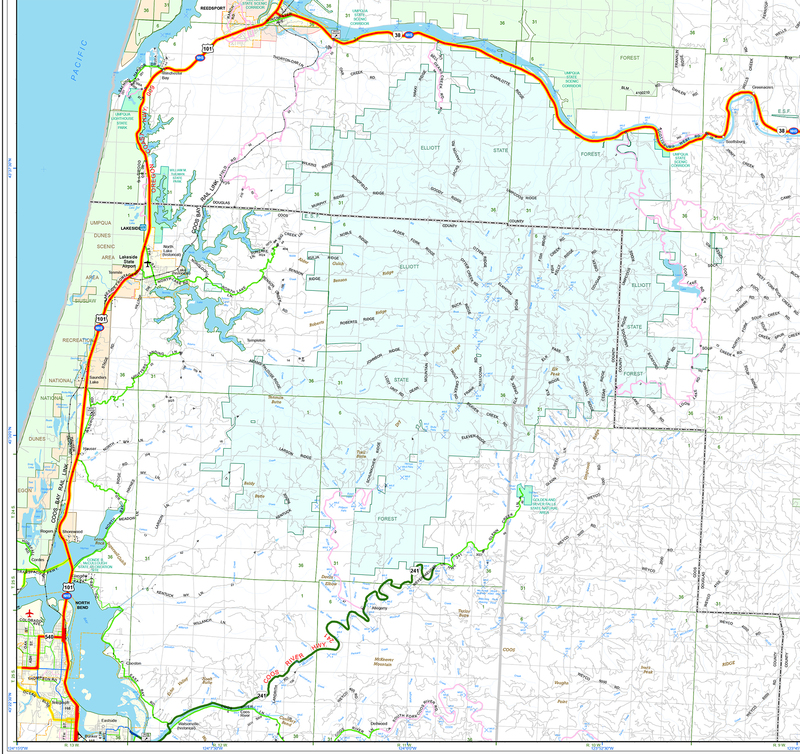 Funding for these trails and ideas can be an investment for the Oregon Community Foundation Grants, or even by Travel Oregon (Oldson 2016: 23). © 2017, 2018 Oregon Websites & Watersheds Project, Inc. & NW Maps Co.